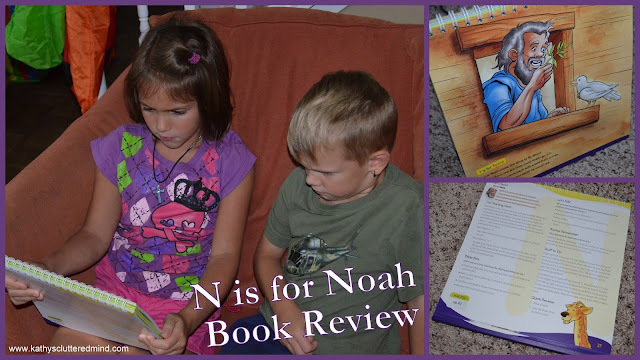 This months Moms of MasterBooks book was N is for Noah Below is my review about the book as well as further details about this months Facebook party. To read more reviews visit the NLPG Blog. N is for Noah is a square 10 x 10, flip-top spiral bound, 112 page book. The book is in easel format so that the book can easily be stood up, making it easy teach with. There is text for the child on one side and detailed information for the parent (or educator) on the back. This is the 3rd book in Ken & Mally Ham's amazing biblically based children's series. Be sure to check out our D is for Dinosaur post. The illustrations are amazing and there are tons of resources to help you share important Biblical truths with your children from A-Z. It is the perfect book for Sunday school, Christian school, homeschool or home devotionals! N is for Noah uses very fun rhymes and cute illustrations to engage children as you work through the alphabet and learn about Noah. Children will learn about why God sent a worldwide flood, how people reacted to Noah's building of the Ark, what happened when the Flood ended and more. The book does a great job of helping children develop skills like memorization and comprehension. And it helps reinforce their understanding about the true history of Noah, the Ark and the Flood. As a Christian family that doesn't attend a church it is so nice to have products like this book available to help me educate my children and teach them about the Bible. "T is for Twice: Twice, Noah chose the dove to fly about. To see if from the ark they could finally go out. When the dove came back with a leaf from a tree. Noah knew now soon the earth he would see." There are several ways you can utilize this book. We first read through the entire book at bedtime once without utilizing any of the lessons. The story was very engaging and made the children think of great questions. The first page has the entire poem written out A-Z. This can be utilized a couple of different ways. You may choose to read it prior to starting the individual lessons or as a review in between lessons or after several lessons. Next you will work your way through the alphabet. The flip top format is set up so that the illustrated, rhyming pages face the child while the back features the lesson. The Starting Point - This section gives a short scripted lesson with the actual Biblical scripture. Bible Bits - A bulleted, simplified version of the lesson where children will repeat each one as you read them. Lets Talk - Provides simple discussion questions which children should answer with true understanding. Always Remember - A short paragraph which sums up the lesson and give children something to think about as it relates to their lives. Children should repeat this back to you. Stuff To Do - Fun projects and activities. One of the projects is to look at pictures of dinosaurs (in a book or online) and discuss the types of dinosaurs that would have been on the Ark. And for additional fun try pronouncing as many names as possible. Quick Review - A couple more discussion questions to reiterate the lesson. There are 26 lessons one for each letter of the alphabet. And if that wasn't enough there are further notes for each lesson at the back of the book. Directed Discussion - More discussion questions with biblical proofs included. Core Truth Takeaway - Additional questions to help start discussions with your children. Quick Review Activity - More fun projects and activities. to go along with the lesson. Be sure to download your FREE N is of Noah coloring pages as well! And you take a sneek peek at the book here. Why: To discuss great books, fellowship with other moms and win great prizes. Prizes include copies of N is for Noah and more. As well as some goodies from the treat sponsor. You can purchase N is for Noah for $16.99 at New Leaf Publishing. You can also get the book on Amazon for $12.23 (current sale price). You can also get ALL 3 books in the series on Amazon for $37.59 (current sale price).